I’ve been running mad this week following last week’s beach vacation, and I’m headed out this morning for a Speed Staging. I thought I’d share an email I received last week along with some “after” photos that came from an online client who consulted with me long distance on a virtual kitchen design. 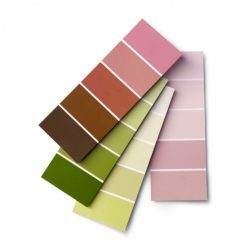 Awhile back…you did an online consult with me to help me pick some paint colors for our new home construction…I just wanted to share with you what you helped me do! We JUST moved into our home a couple weeks ago…so it is still a “work in progress” getting everything how we want it…but I thought you might like to see couple “after” photos. During our virtual kitchen design consultation, I helped Heather make decisions about the right stain for her hardwood floors and colors for her walls and kitchen cabinets, among other things. I told her how to properly hang her window treatments to best effect, and helped her make decisions about her countertop, backsplash, and island color. I also talked her out of the corner appliance “garage,” as I recall. I was so happy to get this email, and to hear she was pleased with the results of our virtual kitchen design consultation! Ok, off to stage a home this morning. Will you be doing something creative this weekend? I’d love to hear what you’re up to! 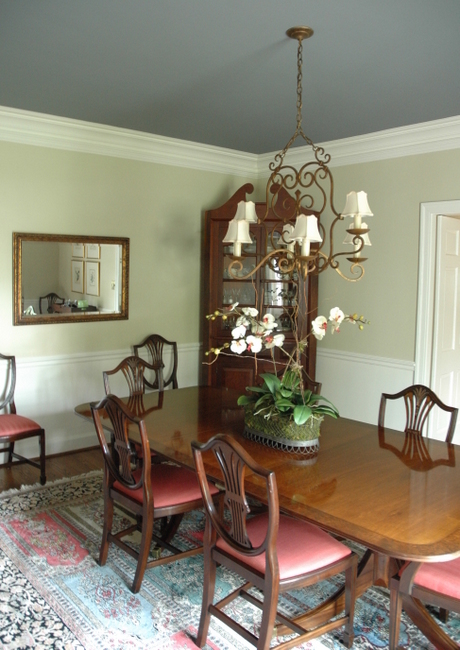 This entry was posted in Color Consultation and tagged benjamin moore, choosing paint colors, color consultation, design consultation, e-design, Edesign, gray owl, kitchen consultation, Kitchen Designs, long distance design, online consultation, paint color consultation, paint colors, quiet moments, virtual kitchen design. 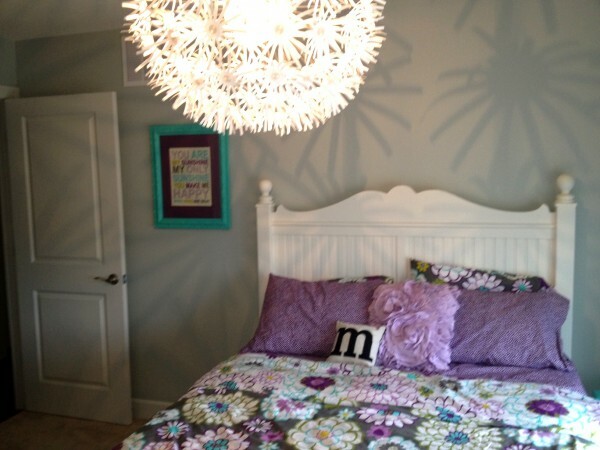 Love these colors and I love that you use Benjamin Moore! We moved here from NC a few years ago, and BM was the staple there and seems to be growing in popularity in the Franklin area- woohoo! This weekend I’m getting our Barn ready for the huge Consignment Furniture Sale we are having next Friday with 70 consignors. If you’re in the Franklin area next week, come by! Thanks Kristin – I got your invite, then Dana T. asked if I’d like to come to the pre-sale. So I’ll see you there!!! So so pretty, Kristie! You made some great recommendations – the kitchen and wall colors are beautiful! I’m not completely against garages, but I think they are not particularly worth the trouble! That roll-y mechanism can break and if you have a great Kitchen Aide mixer, you probably want to show it off. I love marble, but I’m not surprised your fabricator is against it. What does he want you to do, granite??? I’d do honed marble any day of the week 🙂 Maybe do a white Corian in your butler’s pantry? Thank you, Kristie! Our current garage has never given us any problem, and is large enough to house a blender, coffee pot, a small food processor, and the Kitchen Aid mixer (forest green). Haha! Yes, granite! Every kitchen shop in this town (Fort Myers) is pushing granite; very little marble is around here due to the cost. They tell me if I want marble, I need to go to Naples. I think you have confirmed it for me, though. Honed marble in the kitchen (if I can find something in my budget! ), and white Corian in the pantry! Thanks! Right now my husband is picking up 2700 bricks. So I think I’ll be helping lay brick pathways through his vegetable garden. Wow, Eileen. I don’t envy you!!! I love it!! I’m wondering which white and which black you used for the cabinets? They look great!! Kristie, I applaud your work on this one – online consults can be really difficult but it looks and sounds like this one is a big hit. These colors look really nice in her home. What a soft , pretty gray–almost a blue/green gray, at least on my screen. Lovely how it complements the browns in the flooring & next room. Hope you took pictures at the Speed Staging!!! I LOVE to see those. Bet you’re pooped at the end of the day! That kitchen is gorgeous! The wall and cabinet paint go together so well you don’t even really notice the cabinets don’t go all the way to the ceiling. I find it jarring in a lot of new build homes when the short cabinetry is dark wood, which gives it the appearance of levitating, haha. 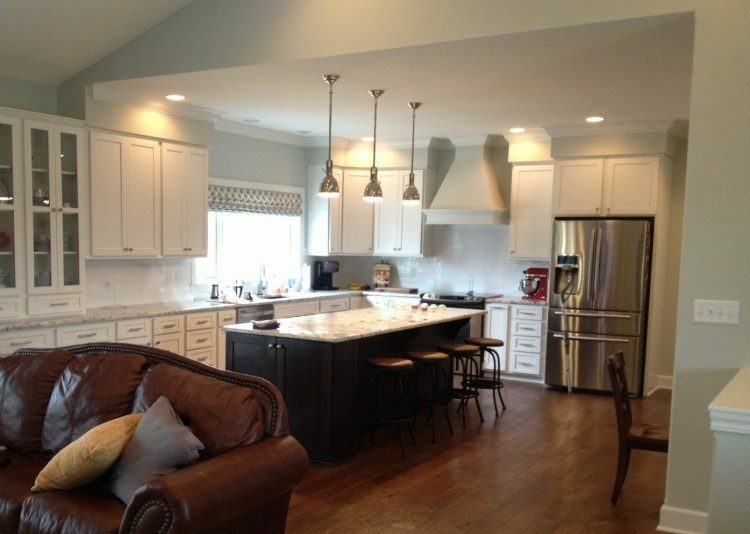 Did you recommend the light counter tops for a particular reason or did the homeowner already have her mind made up? It seems like a lot of light kitchens have dark countertops for contrast but this is a beautiful effect. Love this! 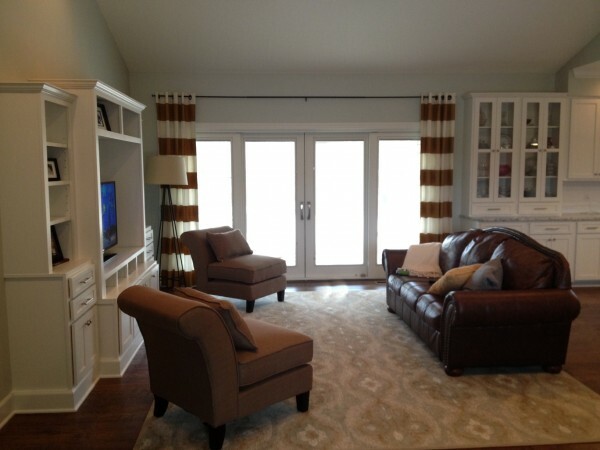 Gray Owl looks so great in this space… and I LOVE how well it works with their “brown” furniture! You do such an amazing job every time! Both beautiful colors Kristie. Great job on the color selection in both rooms! You really pulled it all together in the kitchen for her. No wonder she is so happy!! HI, It looks like i am late to the party! but just came across this picture of the living room and it is an inspiration… and nails what i would like to do with my family room. 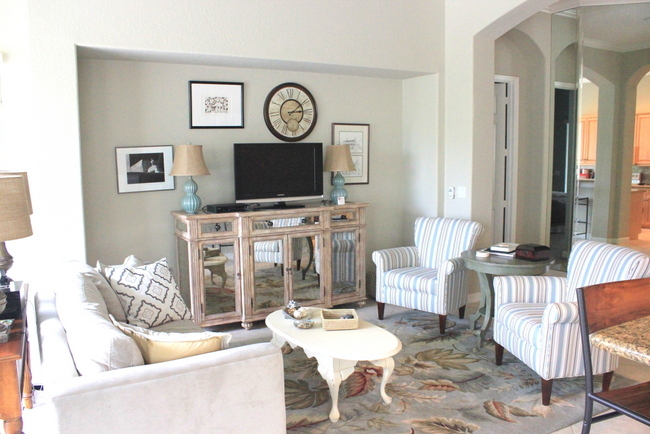 The paint color, the color pf the couch and chairs…. I would have never have thought to put brown striped window treatments in this room, but it works. What other options do you see making a nice fit? Would something with a splash of color e.g. orange be too much?